This is my first Paulo Coelho book. I don't read a lot of general fiction. Somehow, I think that they just weren't for me but after reading this (and The Storied Life of A.J. Fikry) maybe I should start rethinking my choices of books. Veronika is tired of living an uneventful life in a world that carries problems which she's too powerless to stop. She decides to commit suicide but fortunately (or maybe unfortunately), she wakes up in a mental institution. The doctor tells her she only has days to live as complications of her suicide attempt. I have no idea how it happened but this book completely absorbed me. It could be that it made me think. It made me wonder. I'm still into books about depression and suicidal characters. I like how they think, how they sulk (okay, that sounded bad but I like books like that). As Veronika fails her suicide, and the doctor of the mental institution telling her that she only has days to live, she still spends her day finding a way to die earlier. 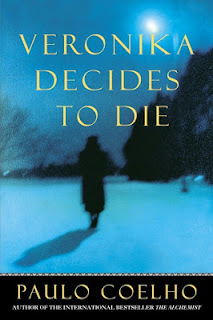 Like many suicide books, Veronika Decides to Die does not only make you think, it also inspires. It's one of those books that tell you to live your life not the way people want you to but the way you want to. I really like how this novel just goes through the mind of a suicidal person and slowly but surely finds her way into finding a reason to live. OVERALL, it may sound that Veronika Decides to Die can easily get lost in the sea of suicide novels, I'll tell you this - it won't. It's unique in its own way - it's inspiring, it's though provoking, and it's got its own interesting voice. I think that Veronika Decides to Die is a highly recommended read for people who'd like an inspiring general fiction novel.